Georgia Tech, the venue and technological centerpiece of the New South. Atlanta is the capital of the state of Georgia and arguably the largest and most influential city for business, technology and culture in Southeastern United States. It is the ninth-largest urban area in the United States, with over five million people living and working in Atlanta and its suburbs. Over the past fifty years, Atlanta has moved from a city with ties to regional commerce to one of international importance. Atlanta, which has been romanticized in such films as Gone With the Wind, is the worldwide headquarters of many national and international businesses and brands, such as Coca-Cola, UPS, Georgia-Pacific, Southern Company, Cox Enterprises, AT&T, and CNN. Additionally, Atlanta was the host to the 1996 Summer Olympics. 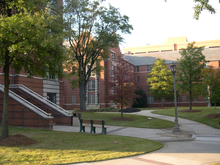 In terms of higher education, Atlanta and its suburbs are home to many nationally-renowned universities, such as the Georgia Institute of Technology, Emory University, Georgia State University, Oglethorpe University, Morehouse College, Spelman College, Agnes Scott College, and Clark Atlanta University. The tagline and overall theme for this Wikimania is "a new day for the New South." With Wikimedia being so influential in today's internet-based technological achievements, we give to the jury a locale that is qualified to take on the task of coordinating a large-scale technological showcase for its members, and how said technology relates to the Internet and Web 2.0, while still providing a laid-back atmosphere only the South can uniquely provide. Atlanta is an ideal choice for this kind of venue, located in an area that isn't so expected for the casual traveler. Although the Southern United States might not be widely known for its technological advancements, it is, in fact, extremely active in technological innovation. The hub of that activity is the College of Computing at our host venue, the Georgia Institute of Technology, nicknamed Georgia Tech. Georgia Tech's Information Security Center is currently active in proposing solutions to beat online security threats; a professor at Georgia Tech has garnered media coverage for his work with video game design and intellectual property issues stemming from copyrights. RoboCup 2007, showcasing the newest innovations in robotics, was held at Georgia Tech this past July. In addition, the fledgling Colleges of Computer Science and Interactive Computing were created this year to delve more in-depth into the realms of technological innovation as it relates to computers today. The College of Computing graduate program is ranked #4 in the nation by Communications of the ACM, the monthly journal published by the Association for Computing Machinery. As far as technology and computing is concerned, Georgia Tech has a lot of innovative work to its credit, and would be more than pleased to have all of you witness its achievements for yourselves. To even have the opportunity to present our bid to you shows that this truly is a new day for the New South, a more cosmopolitan, a more vibrant, and a force to be reckoned with in the 21st century. People of all races, religions, creeds, beliefs and orientations call Atlanta home, and coexist peacefully. Southern charm, business minds, historical relevance, and social zeitgeist. This is the Atlanta of today. Proposed dates: July 29 - August 3, 2008. Hacking Days: July 29 - 30. Main Wikimania Events: July 31 - August 2. Post-Wikimania Event (Party at Carter Center): August 3. Unlike past Wikimanias, we have added the pre-traditional-Wikimania events under the same banner in the hopes that the entire conference be more unified and stir interest among people who may not know much about the early events. In addition to the main event in Atlanta, we have put into the works an organized daughter event with the University of North Carolina at Chapel Hill, to coincide with the Wikimania event. Our contact person at this point is Paul Jones, a faculty member at UNC, director of ibiblio (the third-largest website in the world in terms of content), and advisor to the organizations Carolina Free Culture and the Carolina Open Source Initiative. Jimmy Carter, former President of the United States, humanitarian and philanthropist, and a Georgia Tech alum, is an admirer of Wikipedia and its aims, and as such, we have written a letter requesting that he speak at our conference. We have other speakers in the planning stages, but do not feel comfortable publicizing other names until the letters of invitation are sent out. After the end of the sixteen IRC bid meetings, we held a public, in-person bid meeting on September 21 at Junior's Grill. Our core bid team (Mike Halterman, Craig Spurrier, Andrew Guyton, Matt Britt, Jessica Gibson, Hillary Lipko, Andrea Forte) consists of seven people: four men and three women. Five of the seven bid people live in Atlanta and two do not; however, they can go to Atlanta as needed for preparations and meetings. Instead of asking for a "local team," in the spirit of our theme, we are asking anyone in the Southeast to help us with preparation if they can do so. A list of the contributors (which as of October 6, 2007, currently stands at 61) can be found on the daughter article linked above. A compilation of the most important points and links, for the media and prospective sponsors, has been put on our own website, at wikimania-atlanta.org. The IRC channel #wikimania-atlanta has been created to assist with coordinating this bid. Meetings are postponed until further notice. Other bid-related chat can be found in #wikimania-atlanta. There is also a group on the social networking site Facebook in which interested parties can express their support for the bid. There are 195 people currently in the group. The vast majority of people signed up on the bid are in the group, and the group holds a wider audience as far as volunteer possibilities go. There is a Google group for coordinating this bid. wikimania-atlanta. Wikimania Atlanta's first media publication was on October 3, when The Daily Tar Heel, the award-winning campus newspaper at the University of North Carolina at Chapel Hill, published an exclusive on both the Atlanta and Chapel Hill events. Read more here. Special thanks to Whitney Kisling and Maryann Barone for their dedicated coverage. The Georgia Institute of Technology, more widely known by the nickname of Georgia Tech, is a public, coeducational research university in the state of Georgia, and is primarily notable for its large and highly ranked programs in engineering, computing, and the sciences, although it also offers degrees in architecture, liberal arts, and management. See Academics at Georgia Tech. Founded in 1885 and first opened in 1888, the school has gradually developed from a small trade school with a single degree (Mechanical Engineering) to a much larger role as an independent research university. See History of Georgia Tech. The school has 18,600 students enrolled for Fall 2007, and conducted $345,723,611 of sponsored research in 2006. The Georgia Tech Student Center, on the campus of the Georgia Institute of Technology, is the proposed venue for this conference. See the main article for venue details. Georgia Tech recently held RoboCup 2007 which was a week long event that had almost 2000 participants from 39 countries, so the school knows how to manage large international events like this. The main organizer of RoboCup 2007 is also on the volunteer list for this event. Kennesaw State University, through Leonard Witt, the Robert D. Fowler Distinguished Chair in Communication and director of the Public Journalism Network PJNet.org, will also help us with the bid and organize the Citizen Journalism day. Professor Witt has hosted or co-hosted several civic and citizen journalism related conferences, including The Fusion Power of Public and Participatory Journalism (2004), A Wake Up Call (2005), SoCon07 and Journalism that Matters the DC Session (2007). A sister event, to coincide with Wikimania and would include video link-up to and from the main venue, is in the works to be held at UNC in Chapel Hill, North Carolina. Georgia Tech has several on-campus dorms available to house conference attendees. See Facilities. Local number to contact is +1 (404) 894-2469. Contacted John Nussear, and 500 suite-style rooms are available for all of our dates. Including room price, with linens, breakfast and lunch at the dining hall for our attendees, and administrative costs, it will cost approximately $45-$50 a head per day, which we think is reasonable considering it pays for a room and two meals. Full price quote available to the jury upon request. The Georgia Tech Hotel's July/August 2008 rates are $142 a night (one king bed or two queen beds), and one can receive a discount of $7 a night for each night booked, if one books online. See here for online booking and other special offers. There are also lower group rates for conferences that can be negotiated. There are numerous hotels of varying price and size around Georgia Tech. For a comprehensive list, see here. There are several food vendors, including the Student Center Food Court (incl. Burger King and Chick-Fil-A), Jacket's, Pandini's, and Pizza Hut. (See Conference Services: Dining Services) Multiple restaurants are also located in Technology Square including local, national and international chains and are walking distance from the Student Center. A number of other restaurants located off campus are also within walking distance. Attendees who will be staying in dorms will have access to the dining hall for breakfast and lunch, inclusive in their per night fee for lodging. Atlanta's only major daily paper is The Atlanta Journal-Constitution. Weekly papers include Creative Loafing, The Sunday Paper and Atlanta Nation. A monthly newsprint publication Stomp and Stammer features local music news, indie rock record reviews, and cultural commentary. A handful of other publications exist that serve specific neighborhoods and local interests. The Atlanta metro area is served by a wide variety of local television stations, and is the ninth largest designated market area (DMA) in the U.S. with 2,059,450 homes (1.88% of the total U.S.). All of the major networks have stations in the market, along with two PBS stations and some independent ones. Several cable television networks also operate from Atlanta, including TBS, CNN, Cartoon Network, Boomerang, and TNT. These stations are owned by Turner Broadcasting System (now a subsidiary of Time Warner). Considering positive inroads we have made with Turner in unrelated areas, and considering CNN is located within minutes from the venue, the bid team thinks it is a strong possibility that we may get some press coverage, at some point, by CNN. CNN's iReport feature can turn anyone into a journalist; just take a picture or a video and write a summary of an event, and it is automatically published (with some stories even making it on the air). The Weather Channel (owned by Landmark Communications) also broadcasts from the Atlanta area. Cox Enterprises, which owns the Atlanta Journal-Constitution, WSB-TV, and WSB-AM-FM, is headquartered in Atlanta. A press release (dated September 17, 2007 and updated September 24, 2007) was sent out via e-mail to 76 college newspapers and 27 city newspapers in the Southeast United States. At least one college newspaper is slated to publish an article in the very recent future, others may follow. More press will be brought to the attention of the jury as soon as we are aware. Wikimania traditionally hosts two parties, one for attendees (capacity of 250-350) and one for sponsors and VIPs (capacity 40-60). The Carter Center can hold a large party in the lobby with cocktail reception for 350 people. Alcohol can be catered upon request, with bartenders carding so as to not serve people under 21. Proof of the Pudding is the cocktail reception caterer, unique to the Carter Center, and a contract needs to be worked out with them; prices usually start at $30/head. Price quotes for the lobby of the center: $3,000. Add'l room would be an extra $1,200. With written notice the museum itself can have extended hours so the party attendees can look at the exhibits. Contact people: Molly Howard (404) 420-5113 and Lisa Wiley (404) 420-5111. Price quotes and e-mails on Carter Center services were received from Molly Howard. Mary Mac's Tea Room, an Atlanta institution focused on upscale fine dining combined with Southern cuisine. Full liquor license and bar available. Amy Bending (404) 387-4099. Dates for VIP in regards to Wikimania are wide open. Grand Taste of the South menu is $26 a head, all you can eat. Certain menu items on the buffet need to be pre-decided, and the menu choices can be found here. No room fee, $100 for a bartender. $4 for beer, $6 for wine (glass), $7 for cocktail. Ticketing counters for Delta, Atlanta's major tenant airline. Hartsfield-Jackson Atlanta International Airport is located seven miles south of the city center. It has been the world's busiest airport by passenger traffic as well as landings and take-offs. Delta Air Lines operates the world's largest airline hub from this airport. AirTran Airways as well as several other airlines operate major hubs from Atlanta International Airport. The airport is served by a metro/heavy rail system that provides connections to downtown, midtown and other areas of the city. If you live within a few states of the event, driving may be more economical than flying. We offer this as an alternative to American visitors. Amtrak's Crescent train runs daily with stops in New York, Philadelphia, Baltimore, Washington, Charlotte, Atlanta, Birmingham and New Orleans. The Southbound train arrvies in around 9AM. Northbound the train arrives at Atlanta at around 8PM. The Amtrak station is located at 1688 Peachtree St. N.W. MARTA Bus route 23 stops in front of the station. Greyhound Bus Lines provides bus service to Atlanta from much of the US. The Greyhound terminal is located at 232 Forsyth Street and is directly beneath MARTA's Garnett Station. Round-Trip Fares with 14-Day Advance Purchase range from $54.00 to $198.00. a) You must have a machine-readable passport (this means it should have a line of chevrons (e.g., <<< ) valid for six months past your expected stay in the U.S.
b) Any passport issued after October 26, 2005 must include a digital photo. c) You must have a ticket going out of the US. I.e. only a one-way ticket into the US is not sufficient. Due to stricter airline and border patrol regulations, a passport is now required of all Canadian citizens who wish to travel to the United States, effective January 23, 2007. Fiancées of US citizens, or spouses of US permanent residents, may need a visa even if they are Canadian citizens — especially if they are coming to the US to await final immigration status. For details, see ottawa.usembassy.gov. To get a visa, contact the nearest US Embassy, Consulate, or other authorized institute to find out how long the process will take (generally anywhere from 3 to 45 days). A list of U.S. Embassies can be found at travel.state.gov. Approximate wait times can be found here. More information can also be found at http://www.unitedstatesvisas.gov. A MARTA train station is located at the airport. Take the northbound train towards Midtown Station. Fare is $1.75. From there you can get on the Georgia Tech Trolley. This will take you a few blocks to Tech Square and then to the campus. There is no charge to use the Georgia Tech Trolley and shuttle system. If one is close to the event, driving is recommended. Although traffic is worst at rush hour, traffic is otherwise fine. The school is easily accessible from the Downtown Connector, which links I-75, I-85, and I-20. Buses from Atlantic Station (an open-air shopping mall near Georgia Tech) to the nearest MARTA station) are free, as well as the Georgia Tech bus system. These trolleys/buses stop at MARTA's Midtown Station, meaning fares will only be needed if one has to traverse the city past where the event is being held. Atlanta's Downtown Connector at night, as seen from the 5th Street Bridge that links Technology Square to Georgia Tech's main campus. The "Tech Trolley," one of Georgia Tech's free shuttles that provides transportation from MARTA's Midtown Station to Tech Square and Tech's main campus. Midtown Atlanta, downtown Atlanta, and Buckhead all offer nightlife that caters to nearly every crowd. Midtown, in particular, has a thriving nightlife scene for both straight and gay crowds, and Buckhead's nightclubs are more upscale. Underground Atlanta in downtown, near the Georgia Tech campus, has many nightclubs that do not close until 4 a.m. (the rest of the bars in Atlanta close at 2:30). If nightclubs aren't your thing, there are many areas of unique historical or business interest to Atlanta that you may be interested in. Tours at the CNN Center run every half-hour on weekdays. The tour usually includes a view into the main newsroom, airing live news coverage to the world. In 2007, the World of Coca-Cola moved into a new building adjacent to the Georgia Aquarium, which is currently the largest aquarium in the world. Both the World of Coca-Cola and the Georgia Aquarium are easily within walking distance from the Georgia Tech campus. The Margaret Mitchell House, the house where Margaret Mitchell wrote the book Gone With the Wind, is located in downtown, near the United States Treasury bank. Both offer tours on weekdays. The Fox Theatre, one of the last old picture houses in existence in the United States, now offers classical music and theater productions. Advance notice is required for tours. Turner Field should be in operation, since it would be baseball season. Home games are dependent on the schedule agreed on by the Atlanta Braves for 2008, and what weekend we will visit. For more alternative sightseeing, the Virginia-Highland neighborhood may be of interest. The Sweet Auburn area is home to many historic landmarks, such as the birthplace of Martin Luther King. Oakland Cemetery is a large cemetery dating from pre-Civil War times where such persons as Margaret Mitchell and Bobby Jones are interred, along with a multitude of other Southern historical figures. Many national and international businesses are located in Atlanta and may be persuaded to help our cause. At present, 13 sponsors are in the "final stages" of negotiation, meaning we discuss what sponsorship levels they will give if the bid is given to us. Approximately 30 others have also been contacted and may be counted in for sponsorships. This year our bid spearheaded the "small business initiative" as well, in which small businesses in Midtown are approached to donate with ask levels between $100 and $500. Other bids have since emulated that design. Citizens from the 27 countries listed above do not need a visa to enter the US. Visas for non-listed countries can be obtained fairly quickly from the nearest US Embassy, Consulate, or other authorized institutes. Some have a turn around time as of less then a week (exact wait times). Recently improved visa clearance procedures should help ensure that everyone is able to get an answer fairly quickly. The primary concern for consular officers is the person having “strong ties” to their country; most Wikimedians should qualify without a problem. We intend to work with the State Department to try to overturn any rejections. For those who can not afford the cost of visas or related fees we hope to have financial assistance available. Some places in Atlanta report heavier-than-normal crime (e.g. mugging, theft, assault) for cities of its size. Many places in Atlanta also have panhandlers who beg pedestrians for change and a significant homeless population. The Midtown area, where the event would be held, like most urban areas, has a significant problem with car break-ins and petty theft. The proposed event venues in Midtown, and in fact large parts of Midtown itself, are relatively safe, as many people and police officers traverse the area all night. Additionally, there are local laws in place which prohibit panhandling in the areas surrounding the aquarium, Coke museum and other major tourist attractions. However, if you go out anywhere in Atlanta late at night, common sense should rule your decisions. Never go out alone, don't carry all of your money with you, and make sure valuables (like cameras) are safely hidden on your person. If you have a car while in Atlanta, it is strongly recommended that items of any value not be visible inside the car when it is unattended. This includes things that one might not think of as valuable items such as clothing, books and food. If in doubt, put it in the console, glove box or trunk. Additionally, always lock your car doors, even if you're only leaving the vehicle unattended for a moment. Keeping valuables secured or stored out of sight in your dorm or hotel room is also strongly advised. This is mostly common sense behavior for those familiar with large cities, but may not be common practice for individuals from smaller towns. The Georgia Tech campus is mostly free of panhandlers and vagrants, though some are occasionally found around the outskirts of campus. The areas immediately surrounding campus vary in the amount of crime and undesirable elements. Most homeless will keep to their own business and leave you alone, though some are mentally disturbed and may talk to themselves or verbally abuse you without provocation. In the case of individuals who attempt to solicit your money or attention, the best case of action is to not indicate that they have gotten your attention at all. Do not look at them and continue walking. Reaching into your wallet to find money is not advisable, as an unwanted and dangerous situation may occur. If you observe an individual who looks suspicious or out of place on or near the campus grounds, it is recommended that you contact the Georgia Tech Police at +1 (404) 894-2500. In at least one instance, a panhandler has come up to one of our bid people in a parking lot and claimed that there was a charge for parking, and that he needed to pay $5 or his car would be towed. In these situations, it is best to either ignore them or assert that you are aware that it is not a pay lot (pay lots in Atlanta are common, but also very easy to spot—they either have ticket/gate systems or payment boxes and are always clearly marked with the price for parking). If they persist, inform them you will call the Atlanta Police and ask if that lot is indeed a paid lot. The threat is almost always enough to make them back off. In case you ever need the actual number, which in this case you probably will not, the number is +1 (404) 853-3434. People of all beliefs, races, and orientations are welcome in Atlanta and won't have many safety concerns, if any. Unlike most areas of the South which suffered from racial schisms as a result of the Civil Rights Movement, Atlanta, for the most part, embraced integration and diversity. In the 1950s and 1960s, Atlanta's city advertising slogan was "The City Too Busy to Hate," and Atlanta became the first major city in the South to voluntarily integrate its primary and secondary schools, in 1960-1961. Georgia Tech, our host venue, was the first Southern university to integrate without a court order, in 1961. Since then, Atlanta became known as a "safe haven" for oppressed African-Americans, who eventually comprised the majority of the population in the city; possibly due to this population shift, every mayor elected in Atlanta since 1973 has been black. In the last few decades, this welcoming atmosphere has shifted to people of other ethnicities, nationalities, creeds, and orientations. In the 1950s, Atlanta became the first metropolitan area in the South to allow women to work in city public service jobs, such as the police department and the fire department, and in 1969 Atlanta elected their first mayor of the Jewish faith. Today, Atlanta is perhaps the most cosmopolitan and progressive city in the Southern United States, with thriving ethnic communities, good race relations, and a significant gay village in Midtown near Piedmont Park. MARTA has been consistently rated as one of the United States' safest public transit systems by the American Public Transit Association. Additionally, MARTA's Police Department is the only transit police agency in the U.S. to be nationally accredited by the Commission on Accreditation for Law Enforcement Agencies (CALEA). An Atlanta ordinance bans aggressive panhandling in much of the Midtown area. The area included in this ban extends from Martin Luther King Jr. Drive northward to Ralph McGill Boulevard and from Marietta Street eastward to Piedmont Avenue. The ordinance has not completely eliminated panhandling in the area, but it prohibits individuals from verbally asking for money and from harassing pedestrians and motorists. The Georgia Tech campus is a pretty safe location, and the Georgia Tech police/public safety department maintain a strong presence. Automobile traffic can be extremely congested, particularly during rush hour. Carpool with other attendees, or consider using MARTA. Many popular Atlanta destinations (including the proposed conference centers and numerous hotels and tourist attractions) can be reached using MARTA, free shuttles, and simply walking. If you are driving, drive with the flow of traffic, even if it is moving faster than the posted speed limit (which it usually does). The Downtown Connector has 5 or 6 lanes in each direction, which makes use of a turn indicator very important when changing lanes and merging. Be advised that many drivers do not extend this necessary courtesy, so keep your wits about you. Know when and where the problem spots are. Traffic congestion in Atlanta is pretty predictable. So plan ahead. The MARTA rail system is fairly limited compared to many other public transit systems in terms of where it goes within the city. The bus lines have much greater coverage, but the routes are often confusing. Neither have the most reliable of schedules and delays are not uncommon. MARTA rail does service most of the areas where major attractions and cultural centers are located. Plan ahead. MARTA rail and bus maps are accessible at the MARTA website. Allow more time for travel than you think you'll need. Most rail stations have digital sign boards which show the estimated times until the next train arrivals. These are usually fairly accurate. Be aware of the schedules when using MARTA; If you are heading north of the city, it may be better to board the first northbound train and switch at Lindbergh Center Station instead of waiting for a specific North Springs/Doraville train, especially late at night or on weekends. Navigating some parts of the city can be confusing. There are many one-way streets, which is common in most downtown areas, but this can make navigation difficult for those unfamiliar with the area. Outside of Midtown, most streets do not run parallel and perpendicular, meaning that making blocks to turn around or taking the next street over will not always get you to where you think you are going. Also, there are many streets named "Peachtree." This is a common complaint made about navigation in Atlanta by those unfamiliar with the area. Use Google Maps or a GPS system to get directions to where you need to go. This makes navigating the city many times easier. Pay attention to signage while driving and/or drive with a person who either knows the area, has a good sense of direction or both. The multiple "Peachtree" problem is fairly easily understood by looking at a map. Generally speaking, there are three "main" Peachtrees—West Peachtree St., Peachtree St. and Peachtree Rd. All of these streets run north-south through Atlanta. Rather simply speaking, the three main Peachtrees are the same road. If someone says, "take Peachtree," they are referring to the triad of streets that run north-south through Atlanta. West Peachtree St. is one-way traveling north through most of Midtown. Peachtree St. is one block east of West Peachtree St., has two-directional traffic and runs parallel to West Peachtree St. Just south of Buckhead (north of Midtown), West Peachtree St. and Peachtree St. merge and become Peachtree Rd. All other "Peachtrees" run east-west and intersect one of the three main Peachtrees, and it is unlikely that you will have to navigate any of them. Atlanta's airport serves more passengers than any other airport per year, and is the largest airport hub in the United States. Atlanta is a central hub for international carrier Delta Air Lines, and low-cost national carrier AirTran Airways, making air travel to and from Atlanta relatively easy and affordable. Atlanta is also only a little over two hours away from Birmingham International Airport (BIA) in Birmingham, Alabama. BIA serves as a hub for Southwest Airlines, which offers many affordable flights from all over the U.S.
Chattanooga Metropolitan Airport is also about a two-hour drive from Atlanta. It is occasionally cheaper to fly into this airport than into Hartsfield from one of the nine other connecting airports in Charlotte, Chicago, Cincinnati, Dallas, Houston, Memphis, Orlando, Washington D.C., and St. Petersburg. You can get to Atlanta on a direct flight from nearly everywhere in North America, and most places on other continents. Places not directly served can fly into any one of the United States' other airline hubs, such as New York City, Miami, or Los Angeles, and connect to Atlanta, usually for a nominal fee. MARTA has recently introduced a new fare system at all rail stations that accepts both cash and credit and makes purchasing and keeping track of multiple fares easy and convenient. These fares can be used on rail or bus travel, and transfers from rail to bus (or vice-versa) are included in the fare. MARTA provides guest passes at discounted rates for groups of 15 or more. These passes allow for unlimited rides on rail and bus for the duration of the purchased pass. For more information, see this page. Much of Midtown is pedestrian-friendly, particularly the Georgia Tech campus, Atlantic Station and tourist areas. There are sidewalks throughout most of the city proper. It is hot in Atlanta during the summertime. Like many places in the United States, summertime brings hot conditions. People from Europe especially may not be used to the heat, as their summers are milder. Average high temperatures in late July and early August are in the upper 80s Fahrenheit (31-32 degrees Celsius). The summer of 2007 brought unusually high temperatures to Atlanta, and are not any representation of how Atlanta usually is during the summer months. We advise that travelers please bring sunscreen, wear loose and/or light clothing and remember to drink plenty of water. Afternoon thunderstorms are not uncommon during the summer. Packing an umbrella, poncho or raincoat is recommended. If you are cold-natured, pack a light jacket or long-sleeved shirt that can be carried with you. As a result of the hot weather, many establishments go overboard on air conditioning. While shorts and a tank-top may be comfortable outside in 90-degree (32 C) weather, one may feel a bit chilly in a building chilled to 65 degrees (18 C). Sunshine is abundant during the summer and the weather is usually favorable for outdoor activities. Nighttime and morning lows do not typically fall below 70 degrees (21 C) during late July and early August. Since there is not a particularly large variance between high and low temperatures, it is possible to pack lighter as one does not have to have different sets of temperature-appropriate clothing for different parts of the day. The warm (but not too hot) mornings and evenings are also conducive to exercise, outdoor dining and leisurely strolling through Atlanta's growing pedestrian-friendly areas. Many places in Atlanta close at or before 11 p.m., and public transit stops running at 1 a.m. Certain MARTA stations close at 9 p.m. Generally, the only places that stay open later than 11 p.m. are bars, nightclubs and 24-hour pharmacies, grocery stores and diners. As a result of this, there is not much of a regular nightlife for individuals under 21 and even less for those under 18. Make your own nightlife and plan a night in with your friends at your hotel or dorm or take advantage of the campus' ample green space and organize a nighttime outdoor game. Be creative! Locate an all-night diner (there are at least three close to Tech: City Cafe, Lucky Buddha on 10th St. and the Majestic on Ponce de Leon Ave.), gather up some friends and go out to eat at some ungodly hour. Go to a late movie. There is a movie theater located in Atlantic Station that has screenings that often last until midnight or later. The Masquerade on Ponce de Leon Ave. (about a mile east of campus) is an all-ages venue that often has shows in the $10-15 range, along with "80's Night" which is free on Thursdays provided you find out the week's password from one of the locals and arrive before Midnight. Semi-official nighttime activities for all ages could possibly be arranged if there is enough early demand. Stores may not sell alcohol on Sundays. On any day of the week, stores in Midtown must stop selling alcohol at midnight. "Last call" at most bars in Atlanta is 2 or 2:30 a.m. If you want to purchase alcohol, be sure to do it before 11:59 p.m. on Saturday night. During the week, if you travel outside of Midtown, alcohol can still be purchased in stores after midnight. The most recommended place to go to purchase alcohol after midnight is the Kroger grocery store in the Edgewood Shopping Center located on the corner of Moreland Ave. and Caroline St.
Military bases are exempt from Sunday alcohol laws. Military personnel and dependents can visit Dobbins ARB/Atlanta NAS or other nearby bases. Restaurants may still serve alcohol on Sundays. There are a wide variety of things to do outside of the convention in the Atlanta area, including restaurants, historical sites, tourist attractions, museums, shopping, music and sports. For example, Atlanta has a strength in being the most cosmopolitan urban center of the Southeastern United States, but folks who like hiking or camping or those who enjoy history are well-situated to do pre/post conference side trips. Day trip: Atlanta is in northern Georgia, the trail head for the Appalachian Trail is a 90 minute drive and there are many other local hiking opportunities in the north Georgia mountains and along the Chattahoochee River. Side trip: The Great Smoky Mountains are within a day's drive for the more committed campers and hikers. The new Atlantic Station mixed-use development is a nice place to walk and shop. It is about a 15-minute walk from central campus and is also accessible via the Stinger bus system. It is very pedestrian-friendly and often hosts an open-air craft market and various other events. A variety of retailers and eateries are located here. For a full list visit the Atlantic Station website. Summer in Atlanta brings many free and inexpensive entertainment opportunities including Flicks on Fifth and Screen on the Green (free outdoor movie showings in Tech Square and Piedmont Park, respectively), radio station-sponsored concerts, art exhibits and Atlanta Braves baseball games are just a few of the activities that can be done "on the cheap." Places of worship for a variety of religious and spiritual traditions are located in Midtown, many are within walking distance of the Georgia Tech campus or are accessible by MARTA. The main article (linked above) has a list for your convenience. Only places of worship near the venue are listed and even then, it is still an incomplete list. In the event that any conference attendee would need medical care, the public hospital in Atlanta is Grady Memorial Hospital, an award-winning, world-class Level I trauma center, and one of the most prestigious hospitals in the Southeast United States. Payment plans and establishing insurance is the easiest to do at Grady, as they specialize in treating everyone regardless of income. Ambulances in the Georgia Tech area usually take patients to Emory Crawford Long Hospital, as it is closer to the campus. Atlanta is "twinned" with eighteen cities across the globe. Sister cities include Brussels, Salzburg, Bucharest, Port of Spain, Montego Bay, Lagos, Fukuoka, Toulouse, former Wikimania host city Taipei, and even Ancient Olympia, the site of the original Olympics. Exchange rates quoted are as of September 18, 2007 according to x-rates.com, which bases its figures off of rates released by the Federal Reserve Bank of New York and the International Monetary Fund. This page was last edited on 16 February 2017, at 08:11.